MBARARA – Mbarara City and Kampala Capital City Authority (KCCA) played to a goal-less stalemate in the Uganda Premier League at Kakyeka Stadium, Mbarara on Wednesday. Right from the opening half, both sides showed the intent to find the back of the net but it was all in vain. 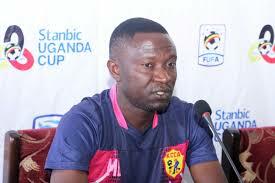 While speaking to the press after the game, KCCA FC assistant coach, Morley Byekwaso said that his player where panicking in the first half but later, gained confidence. “My players were panicking in first half as they lacked confidence to face Mbarara City but later on they settled.” said Byekwaso who was in charge as head coach Mike Mutebi is currently serving a four match ban. Byekwaso also added that his players tried though the conditions where not favourable because of the pitch but then saluted them for getting a point. “The boys have managed to get an away point despite the pitch not being good. Morley Byekwaso also lauded Mbarara for being a strong team, stressing that they are one of the contenders for this year’s crown. “The hosts were a strong team, they just failed to convert their chances, they can as well win the trophy. The draw left KCCA still top of the standings with 37 points from 16 games. Mbarara are 3rd, 8 points behind the Kasasiros.